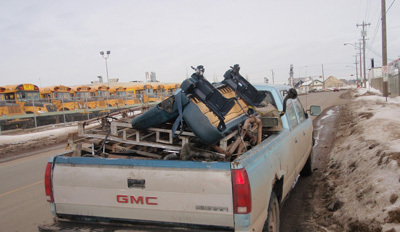 It is common to see vehicles hauling material in Edmonton. However, drivers sometimes forget to secure their loads properly, allowing things to fall off along the way. Material from an unsecured load that falls onto the road endangers other drivers and creates litter, which is unsightly and bad for the environment. Securing your load with tie-downs, a tarp, or cargo net doesn’t take long. These items can be purchased for less than $20 at most local hardware stores. Commercial drivers and carriers should refer to the Commercial Vehicle Safety Regulation of the Alberta Traffic Safety Act, as well as the National Safety Code Cargo Securement Standard 10, to ensure they are transporting cargo properly to prevent items from spilling, blowing off, falling, or shifting on or within the vehicle while in transport. If your load does fall onto the road, take reasonable steps to safely remove it. Also report the spill to the City by calling 311 and to the Edmonton Police Service, so they can make sure other drivers are protected.